In a small pan, heat over low heat the milk for a couple of minute until lukewarm. In the mean time in a large bowl, toss the flour, sugar, salt and cinnamon and mix well. Add the milk and mix vigorously until all the ingredients are well combined. Melt the butter in the pan used to heat the milk over low heat, make sure not the over cook the butter. Add the butter to the batter and mix well, set aside and leave to stand for a couple of minutes. Heat a frying pan, butter the pan so the pancakes won’t stick. Holding onto the handle of the pan, remove it from the heat pour the equivalent of 3/4 of a ladle of batter in the middle and swirl the pan so that the batter coats the bottom of the pan. Return the pan the heat and cook for a couple of minutes. With the help of a flat wooden spoon or non metal spatula loosen the crêpe from the pan, flip over the crêpe and if necessary use your fingers to do so. 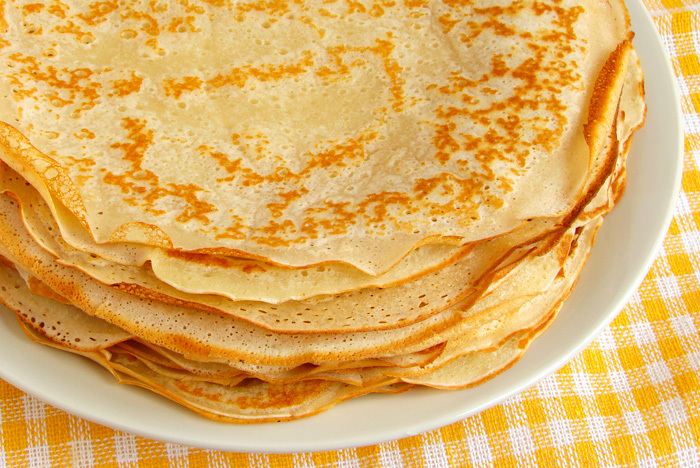 After the crêpe has finished cooking, gently slide it out onto a plate. Repeat until you finish the batter, make sure to butter the pan between each crêpe.